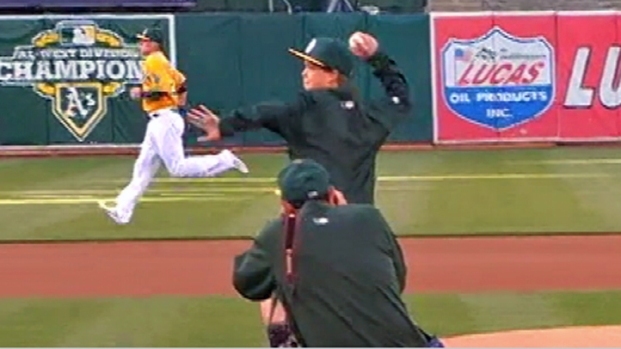 Twelve-year-old Aaron Hern strolled to the mound at the O.Co Coliseum in Oakland Tuesday night to a rousing ovation from both A's and Giants fans. His ceremonial first pitch went to Brandon Moss, one of the A's who visited Aaron in the hospital in Boston right after the bombing. His pitch had some sink to it, but his spirits were soaring. "I can't explain it just being on the field is pretty crazy and getting autographs and meeting players." The Martinez boy was severely injured in the Boston Marathon bombing. He sustained some loss of hearing and serious leg injuries. "Physically I'm doing a lot better. I get tired easily and when I lose it I'm like done. I have to sit down or something." The Martinez child who was hurt in the Boston bombing last month says he pretty much all better physically, but still has nightmares about the explosion. Those legs were tested at the game, said his mother, Katherine Hern. "We forgot his crutches and he has walked pretty well for short distances, but had to walk all the way from the BART station to here. I was nervous the whole way." This comeback kid also has to deal with the mental impact of that bomb blast. "Mentally it's still a lot. Once in a while I have bad nightmares-stuff like that, but otherwise I'm pretty good," Aaron said. His father, Alan Hern, said there have been lots of positives, but it's a bumpy road to recovery. "Sometimes he'll say he'll feel a little scared in certain places that aren't scary places. It's not consistent, sometimes he just has that feeling." His little sister, Abigail, likes Aaron's progress. "I'm happy because every day I come home from school and Aaron is getting better. I was really scared when I heard he got hurt." Mom said supportive community events, certainly like this one, make up for Aaron's Little League games and swim meets-two things he can't do this year. Aaron, like any baseball player, is taking it all one day, one event at a time. "I'm really thankful to be able to do this. I'm just happy to be here and be able to do this because it's really fun."